Maybe they got up from the bench and they're Black Dog Man. I'm not sure if you're being serious or sarcastic here. Could you please clarify? Thanks. I still haven't heard back from the Museum on my request. I'll keep everyone posted. Well, Black Dog Man is somebody, right? So who was right there in the area? I have no problem whatsoever with whether you were being serious or sarcastic about this. It was hard to tell considering your many posts over the years where you can be serious and, yes, sarcastic at times. Your answer above seems to indicate that you weren't being sarcastic but that you were serious. 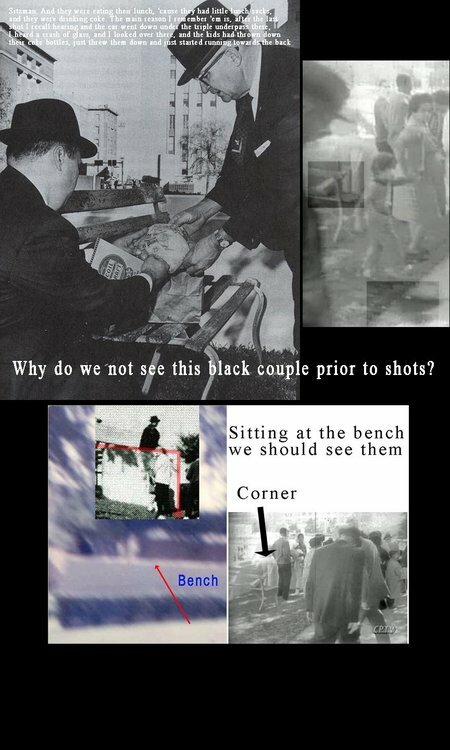 The young, black couple sitting on the bench behind the retaining wall left the bench to see the President and were photographed twice by two different cameramen as they stood at the top of the stairs when the shooting began. Who else could it have been? "Who was right there in the area? ", you asked. That's how I understand what you were trying to say. Am I correct? I hope so. Black Dog Man was a image in a picture open to interpretation. Some have speculated he was Tippitt. I've seen no corroboration it was a DPD Officer. Why he's called that I'm not sure, the DPD had no black officers at the time. The planners of the assassination would not have used a DPD officer with limited rifle experience. They would have used a professional for the kill shot. Military/CIA, CIA sponsored/trained Cuban, possibly a French or Corsican ah la Bill Harvey. It makes sense to me that the couple would leave the bench and stand where BDM is to see the President. I'm not familiar with the photographs of the couple you refer to "at the top of the stairs." Do you mean where BDM is? Further back, or where the three men were standing? Edit: If you're referring to the photos with the black couple posted by David above, that was well after the shooting. BDM is not well after the shooting. David asks why don't we see this couple before the shooting. If they're BDM, we see them. I was confusing Black Dog Man with Badge man here. I asked Hugh Aynesworth a few months ago about the red liquid he saw. This is what Hugh also told me. Okay, I finally got the 2007 oral history. I would prefer to quote it directly, but the Museum seems pretty strict on what I can and can't do with it, and direct quotes seem to be on the no-no list. I'll try to summarize what I hope are all the relevant portions the best I can. Couch recollects that he was in the fourth or fifth car behind the presidential limousine. The car was just beginning the process of taking the turn when the assassination occurred. At the second shot, whoever was sitting behind or beside Couch (possibly Bob Jackson) exclaimed something about seeing a rifleman in the TSBD window, and then Couch himself saw a glimpse of a barrel receding. Couch was able to jump off the car he was in as it was nearing the expressway. Couch then ran back toward the TSBD. I have several problems with Hugh Aynesworth's reply. 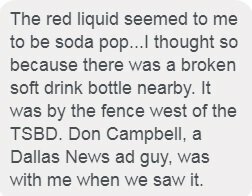 It assumes that Jerry Coley and Jim Hood, two adult men, one a professional photographer, could not tell the difference between soda pop and blood, especially with a broken glass bottle lying nearby. According to Coley, the spot was beginning to coagulate. Also, Hood tasted it and declared it to be blood. According to Coley, Aynesworth joined them the next day, not the day of the assassination. Coley says at that next-day visit with Aynesworth, the spot was completely gone. Even assuming that Coley and Hood couldn't visually tell the difference between soda and blood, or that it wasn't coagulating, or that Hood's taste buds went on a sudden fritz that made cherry or strawberry soda taste metallic and unflavored at that moment, why in the world would the feds come into the office, take away the photo of the puddle, and then bully the staff into silence? All that over a bottle of broken soda pop? Why would anyone repeatedly threaten the lives of Coley's family over a puddle of spilled soda? We do see them in Willis and Betzner. Standing at the very top of the stairs. On the concrete. Not in the grass behind and against the retaining wall as some have said. A female closest to the camera. A male to her right, blocked from our view by the female, just as Emmett Hudson was blocked from our view by his "young fellow. . . about in his late twenties," in the Willis photo. In other words, this female and male are what we now call "Black Dog Man." They could only have been Sitzman's "colored couple. 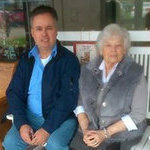 . . between 18 and 21, a boy and a girl" who were sitting on the bench prior to the motorcade coming down Elm Street. There was no one else it could have been. So, yes, we should have seen them if they had been sitting on the bench just before the shots were fired in both Willis and Betzner. But they weren't on the bench. By then they were standing at the top of the stairs.